Religion in America: How many Gods do we have? Posted on Tue, Oct 18, 2011 : 6:25 p.m.
Click on the link in today’s story to download a PDF of the new Baylor report. Editor's note: This post is part of a series by Dr. Baker on Our Values about core American values. This week, Dr. Baker is discussing religion in America, American's concepts of God, and how God interacts with us in our lives. The vast majority of Americans say they believe in God. This fact has been confirmed in survey after survey. Belief in God is one of the ways in which America is different from other economically advanced democracies, as we have reported in OurValues. But do Americans believe in the same God? In other words, do we share one conception of God? The answer is no, according to a new report from the Baylor Religion Survey, which asked over 400 questions about religion and spirituality in America. It’s one of the most in-depth studies on these topics. Thanks go to our colleague Bill Tammeus, who alerted us to this new wave in the Baylor study. 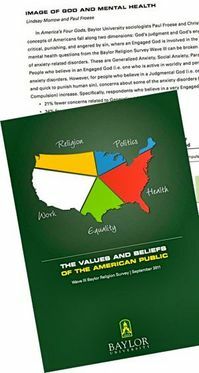 Want a copy of the entire 60-page report on “Values and Beliefs of the American Public”? Click here to download a free PDF copy of the Baylor report, pictured at right. Four Gods live in the American religious pantheon, based on how Americans answered 29 different questions about God’s character and behavior. Analysts at Baylor distilled these answers into four images of God. Which one is closest to your view of God? Authoritarian God: The Authoritarian God is highly engaged in our daily lives and world affairs. This God keeps a close eye on what we do. The Authoritarian God helps people make decisions and has a hand in the economy and natural disasters. Critical God: The Critical God is not actively engaged in our lives. He is a distant observer who doesn’t like the world he sees. Divine reward or punishment will be made in the afterlife. Which of the Four Gods do you see? If you see the Authoritarian God, you are in the largest group of Americans. About three of 10 Americans (31.4 percent) believe God is actively engaged and angry. The next largest group (24.4 percent) is the opposite, believing in a Distant God — unengaged and unemotional. Almost as many (23 percent) believe in a Benevolent God. Sixteen percent believe in a Distant God. The remainder, just over 5 percent, are atheists. Please, add a comment below — tell us which image of God fits your beliefs. Connect with other OurValues readers via Facebook! You’ll be helping to expand our experiment in civil dialogue on the most challenging questions Americans are facing these days. Mon, Oct 31, 2011 : 4:14 a.m.
What are the names of these four gods in the American pantheon? Any suggestions? Critical God sounds like a former boss of mine. He was rarely to be seen, showing up only occasionally to complain about something or someone. My co-workers and I reading each other's annual reviews was great fun. Sun, Oct 30, 2011 : 11:39 p.m. Wed, Oct 19, 2011 : 10:07 p.m. Seriously? Doesn't this kind of help to prove the ridiculousness of this whole religion thing? I thought Christianity was a monotheistic religion, guess not. Honestly, if the monotheistic religions would just embrace polytheism and stop illogically and offensively claiming that they've got it right and everyone else should listen to them simply because of a book and a long history documenting the manipulation of unintelligent masses by a small group of elite in search of power and control, things would get a lot better. Wed, Oct 19, 2011 : 1:05 p.m. The stats or words look garbled in the &quot;which of the four gods&quot; paragraph. Check out what the poll results would be for National Academy of Sciences members - though I'm not implying you should buy arguments from popularity. Wed, Oct 19, 2011 : 2:46 a.m. Wed, Oct 19, 2011 : 9:57 p.m.